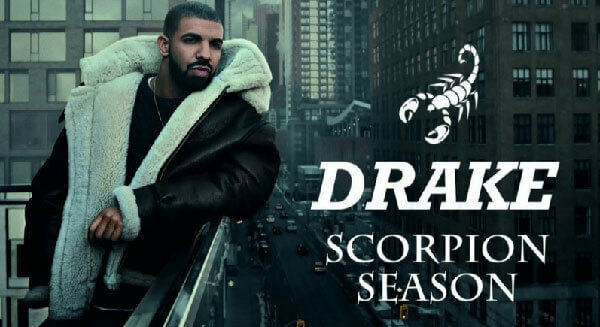 Scorpion is the fifth studio album created by Canadian rapper Drake and was released on June 29, 2018. It features guest appearance from many well-known stars such as Jay-Z and Ty Dolla Sign. And the posthumous appearances from Michael Jackson and Static Major and much more. This	album includes	top singles "Diplomatic Immunity", "God's Plan", "Nice for What", "I'm Upset" , "Don't Matter to Me", "In My Feelings" from the Billboard Hot 100. Scorpion has a good reception after its release. In its first day, it broke Spotify's one-day global record with 132.45 million streams. This is 50 million great than the previous record. In Drake's home country, Scorpion serves as Drake's eighth number-one album. And it was sold 70,000 units in its opening week. In the USA, it is debuting at number one. But the album sells 692,000 less pure copies than the album "Views" and 66,000 less than "More Life". What is worth to mention is that Scorpion is the first album to spend the first four weeks at the top of the Billboard 200 in two years. Do you interest in it too? If so, please continue to read on to find more details and the tips on Drake Scorpion MP3 free download. Scorpion holds onto the No.1 slot for a fourth week on the Billboard 200 chart, making it the album with the most weeks atop the list in 2018. It is undoubtedly the best album ever. At Metacritic, Scorpion received an average score of 67 out of 100 based on 26 reviews. Alexis Petridis of "The Guadian" described the album as frequently fantastic. He makes a stronger claim for Drake's greatness than any other swaggering braggadocio. Also, he noted there isn't enough material to support its gargantuan running time. Mikael Wood of "Los Angeles Times" commented yet for its tiresome megalomania, Scorpion is so beautifully rendered. Scorpion is a double album consisting of 25 tracks. The "A side" is primarily a hip hop album while the "B side" is known as "R&B and pop. The A side includes songs "Survival", "Nonstop", "Elevate", "Emotionless", "God's Plan", "I'm Unset", "8 Out of 10", "Mob Ties", "Can't Take a Joke", "Sandra's Rose", "Talk Up", "Is There More". The B side has the songs "Peak", "Summer Games", "Jaded", "Nice for What", "Finesse", "Ratchet Happy Birthday", "That's How You Feel", "Blue Tint", "In My Feelings", "Don't Matter to Me", "After Dark", "Final Fantasy", "March 14". Scorpion was initially only available on Apple Music, but it quickly expand to other streaming music platforms. Such as Tidal, Pandora, YouTube, Amazon Unlimited, Spotify and so on. If you'd like to stream the songs for free, you'd better do that from Spotify. There are many streaming music service in the market like Apple Music, Tidal, Pandora, Google Play Music, Amazon Unlimited. With one music subscription, you can stream Scorpion album online easily at home or in the office. But you may want to listen to the album when you are on your commute, waiting for a bus, driving a car or taking a train. The question here is can you simply download and transfer the music to your car, mobile phones via USB or SD card? So that to listen offline without using any cellular data. Well, nowadays almost all the music apps are added with the DRM protection to prevent users from exporting songs. So don't expect an official way to do that. But you also don't need to worry. An innovative tech company have learned the demands of users and rolls out a series of music rippers to do that. 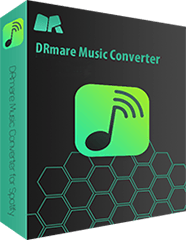 You can use the DRmare Apple Music Converter for Windows/Mac or DRmare Spotify Music Converter for Windows/Mac. It can extract music from Drake Scorpion album on iTunes or Spotify. The latter one is highly recommended as it supports free streaming. 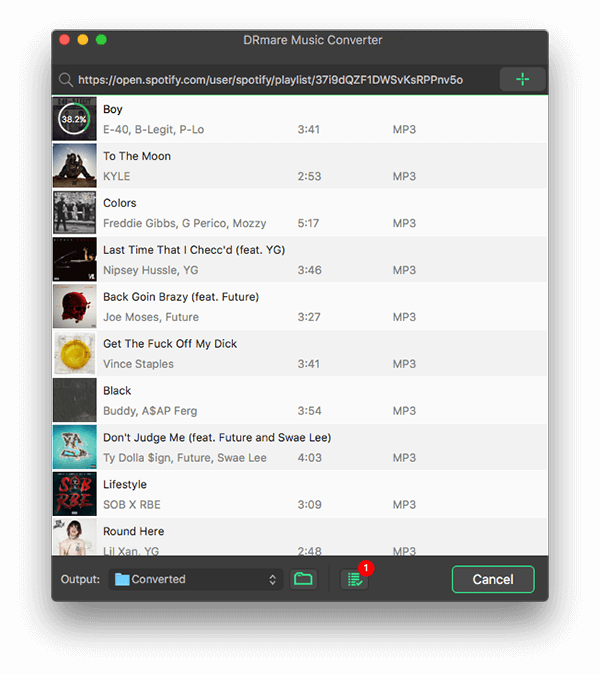 Now I will take the Spotify for example to show you how to save the Scorpion MP3 files offline. You can download the DRmare trial version for free on your computer. And you don't have to subscribe to the Spotify premium to achieve this task. Please just follow the steps. If you have already got the link of the album, you can paste it to the top search box of the software and press "+". Else you can go to the Spotify app to search the Drake Scorpion. And then you can drag and drop the entire album to the DRmare program's main screen. 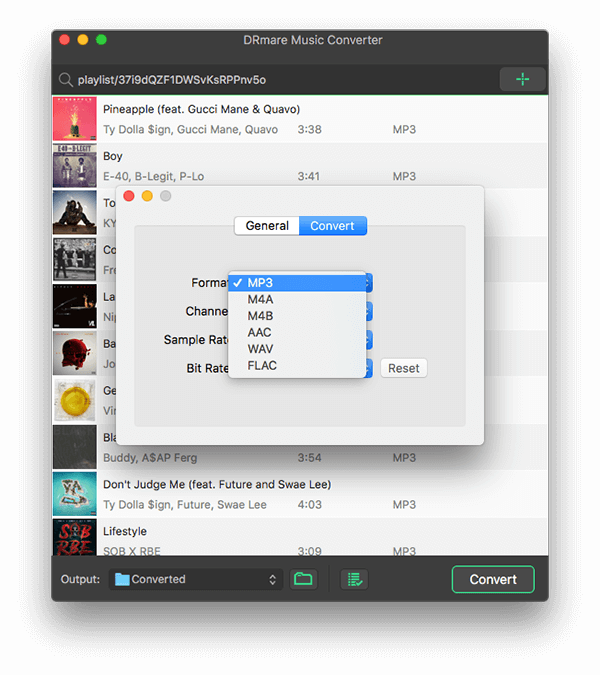 No matter what you use the songs for, MP3 is a first choice of the audio format. That is because it balances the quality, file size, device compatibility. Besides, there are a lot of other options to customize the output files such as bit rate, frame rate, sample rate, codec and so on. 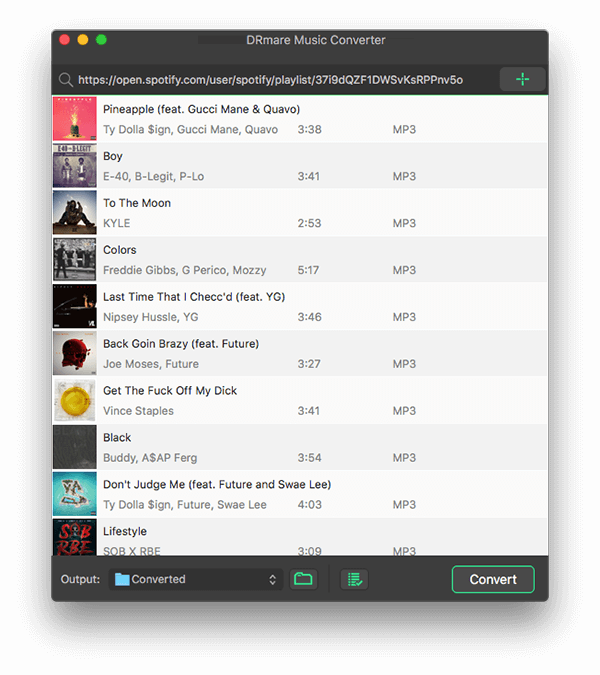 And you can select the output folder and archive your files by album/artist. After that, you can head to the bottom of the software and click "Convert". It should start to remove Spotify DRM and download all the 25 songs from the Drake Scorpion album to your local computer for free within a few minutes. It converts songs one by one continually. You can go to do other things without standing by your computer during converting. To find out how does it work easily, you can also visit this quick video tutorial. That is all it is to it. Hope you enjoy Scorpion MP3 freely anywhere. Do you still have any questions about this guide? Please do not hesitate to let's know from the comments below if you need any help.